The Portrait bust of Countess Du Barry is a work of art of one of the most significant court artists of French King Louis XV, Augustin Pajou. This statue was acquired for The Royal Palace in Belgrade by the means of official purchase in 1955. Countess De Berry was Louis XV’s favourite mistress, who had an undeniable taste for the best artists of the time. From 1770 until 1773 the first sculptor to the king made five variances of sensual portrait busts of king’s favourite. They are all significantly marked by the changes in her hairstyles. The masterly working of the material enhances the beauty of the subject whose features the artist had idealized without seeking to express her character. The harmonious proportions, fluid lines and masterly shaping add to great sensuality of this exceptional work of art. The head is turned slightly to the left drawing efficiently attention to the characteristic hairstyle. The hair is drawn up on top of the head in tiara style, exposing a smooth high forehead and then falls away in thick swirly curls over naked left shoulder. In this way, Pajou invites the spectator to follow the movement of the hair and to move around the statue. 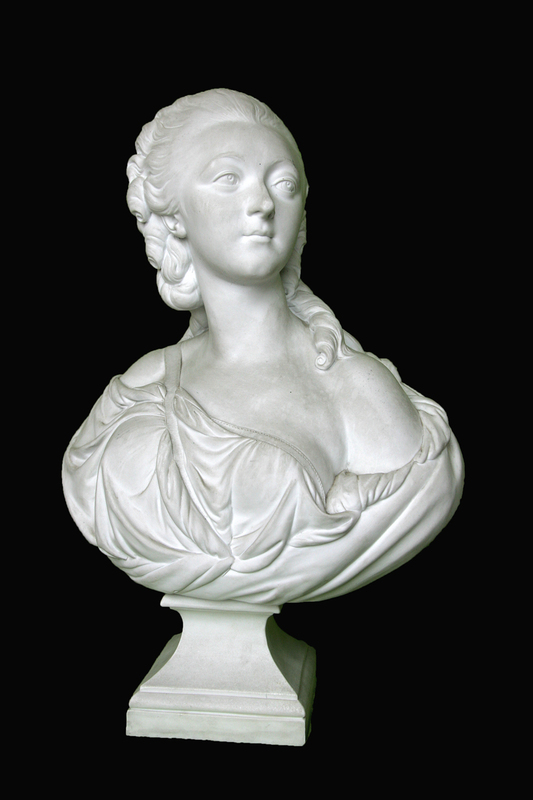 The portrait bust of the Countess De Berry was executed at a time when a new taste in sculpture was emerging that favoured values of Antiquity. Unlike his contemporary and rival Houdon, Pajou interwoven new classicistic tendencies with late baroque aesthetics and did not seek to render the psychology of the figure but idealized it so it so as to imbue it with immanent beauty. The young woman is not depicted wearing contemporary clothing but a toga secured by a strap across her right shoulder in the ancient Greek fashion. The style of the drapery is more subdued although it retains some of the characteristic rococo gaiety. The impassive proud bearing of the countess gives her serene nobility of an ancient goddess. Manufacture Nationale de Sèvres was the very beginning known for hiring most important French artists. Painting templates and sculpture models of prominent artists were used in production. In most cases models of portrait busts in terracotta were reproduced in biscuit porcelain. It happened also that the sculptures made of marble were later reproduced in porcelain. Such is the case with a portrait bust of the Countess Du Barry. 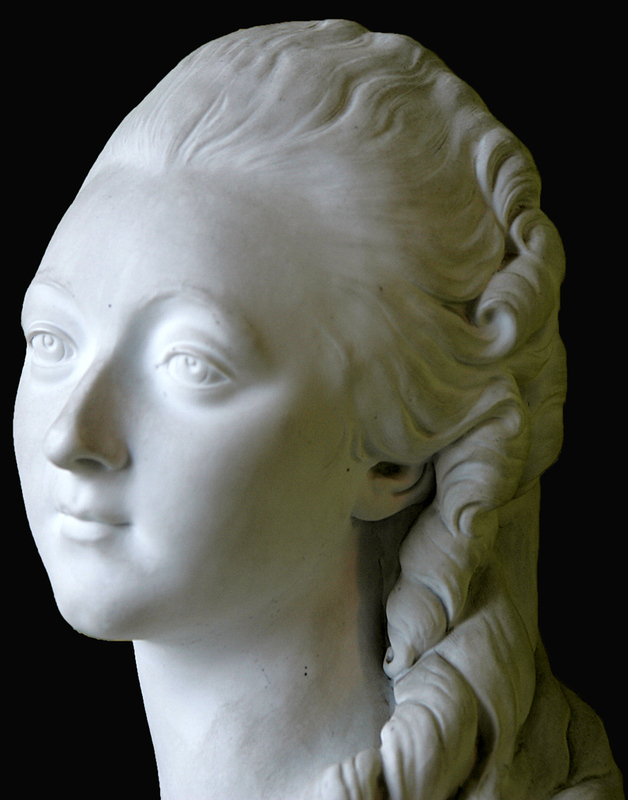 The first portrait bust of the Countess, made in marble by Augustin Pajou, is now kept in the Louvre, while the models of this portrait in porcelain can be found in many private and public collections around the world. Augustin Pajou was born in 1730 in the Faubourg Saint-Antoine, then one of the poorer sections of Paris. His father, a sculptor, was his first teacher, but Pajou showed such promise that he soon entered the studio of sculptor Jean-Baptiste Lemoyne. Four years later, at the unprecedented age of eighteen, he won first prize in sculpture at the Acadmie Royale in Paris. As winner of the prestigious Prix de Rome, he was financially supported by the king during his course of studies at the Acadmie de France in Rome. 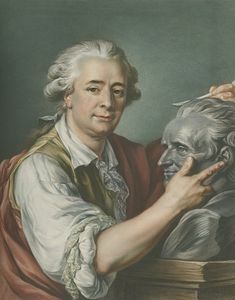 During the 1760s, Pajou worked on numerous official commissions including the decoration of the Salle de l’opéra at Versailles, the Palais Royale and the Palais de Justice. At the beginning of the 1870s he enters the circle of protégés of the famous Countess Du Berry who ensured his popularity. 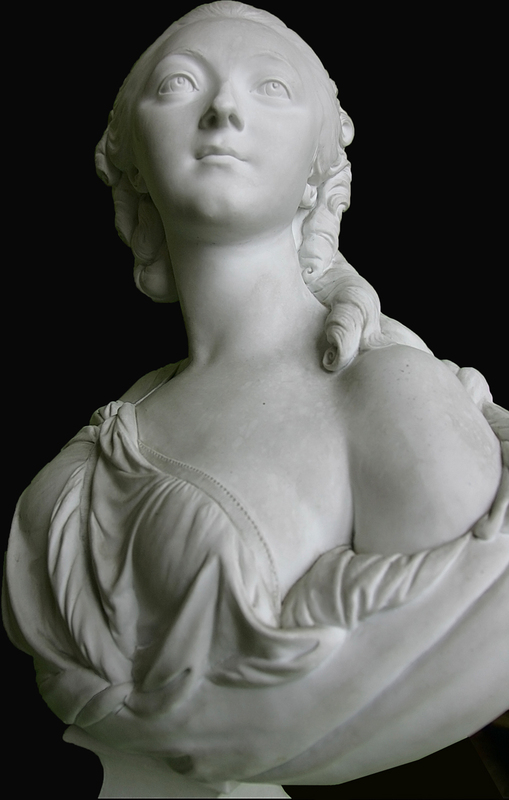 The Bust of Countess Du Berry brought Pajou immediate fame and he was renowned as unprecedented portraitist of women. During the French Revolution, Pajou was appointed to a commission charged with the conservation of French monuments. After spending a few years in Montpellier avoiding the bloodbaths in Paris, he returned to the capital but became too ill to work. Eventually he was evicted from his studio in the Louvre in 1806, and he died three years later.